Who were the first humans to enter the North American continent? Were they humans who founded what is known as the Clovis culture over 13,000 years ago? Or did other, totally unrelated peoples precede the Clovis immigrants? This issue has been intensely, if not bitterly debated for decades. The Clovis culture has been seen as the cradle of North American indigenous culture. Now new international research shows that people of another culture and technology were present concurrently or even previous to those of Clovis. Scientists have added a new and dramatic chapter to the history of the peopling of the Americas striking a deadly blow to the “Clovis First” theory that has dominated pre-historic American archaeology for so long. The sensational results are published in the international journal Science. Evidence that a non-Clovis culture was present in North America at least as early as Clovis people themselves and likely before is presented by an international team of researchers from the USA, the UK, and Denmark. 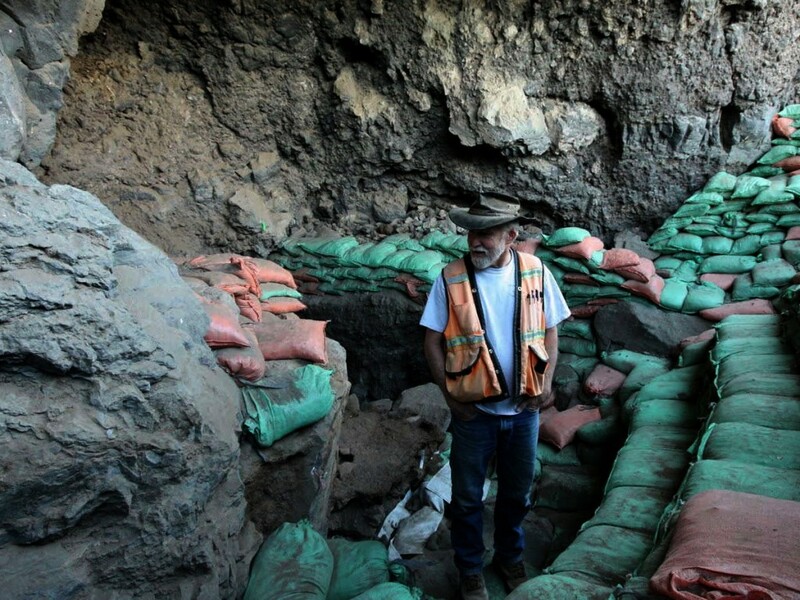 Archeological excavations at the Paisley Caves in south-central Oregon were led by Dr. Dennis Jenkins from the University of Oregon. Dr. Loren Davis of Oregon State University mapped the stratigraphy and studied the site formation processes. Dr. Paula Campos and Professor Eske Willerslev from the Centre for GeoGenetics at the University of Copenhagen, Denmark, profiled the many DNA finds from the caves. Dr. Thomas Stafford, Jr., also from Centre of GeoGenetics, was in charge of the radiocarbon geochronology and biogeochemistry. The evidence for a pre-13,000 year old non-Clovis culture in North America includes obsidian and chert artifacts known as Western Stemmed projectile points, and DNA-profiling of dried human excrement — more accurately known as coprolites. Both obsidian projectile points and coprolites were excavated from sediments in the Paisley Caves. Previous investigations found that human coprolites in the caves predated the Clovis culture by over 1,000 years; however, critics questioned the interpretations by saying that the cave strata had not been sufficiently examined and that no Clovis-age stone tools had been found with the coprolites. Critics also questioned whether or not younger DNA could have been washed down through the cave’s sediments, thereby contaminating non-human coprolites with more recent human DNA. If true, evidence for pre-Clovis human presence would have been bogus. The new study refutes every one of the critics’ arguments and uses overwhelming archaeological, stratigraphic, DNA and radiocarbon evidence to conclusively state that humans — and ones totally unrelated to Clovis peoples — were present at Paisley Caves over a millennium before Clovis. The new results severely contrast with the “Clovis First” theory for early peopling of the Americas. The Clovis First hypothesis states that no humans existed in the Americas prior to Clovis, which dates from 13,000 years ago, and that the distinct Clovis lithic technology is the mother technology of all other stone artifact types later occurring in the New World. This theory has been predominant since the first evidence of human presence in America was found in 1932 at the Clovis type locality in Blackwater Draw, just outside the village of Clovis in New Mexico. But now this praised and respected foundation of American prehistory has been overthrown. It’s not the first time that the partners Dr. Jenkins from the US and Professor Willerslev from Denmark rewrite American prehistory. In 2008, the two researchers presented a DNA-profiling’s and radiocarbon dating of coprolites moving the first human settlements in North America back in time by one thousand years, from 13,000 to 14,340 years ago. As if that was not enough, the team showed through DNA analysis of ancient human excrement that these people originated in Asia and were the probable predecessors of modern indigenous Americans. With the new results the international team has added an important piece to the puzzle of who peopled the Americas — the final continent on Earth to be colonized by humans.